Upon surveying the area, the team found 19 sites that showed signs of human occupation, mostly middens, or piles of detritus left over from generations of tool making and food preparation. Although they were essentially prehistoric trash piles, these middens offered a wealth of useful archaeological clues, some deposits covering more than 75,000 square meters (over 18 acres). 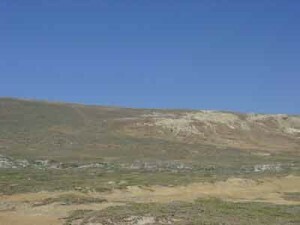 Nine of the these sites contained the distinctive Channel Island barbed stone points that are indicative of Paleocoastal culture from the late Ice Age, Rick reported, and several also contained caches of shells from red abalone — a staple food of Paleocoastal Indians. The large amounts of shells, found with stone tools several kilometers from the ancient shoreline, suggest that the shellfish were carried inland to be processed, Rick said. And even more important, the shells — unlike stone — can be radiocarbon dated. All four of the abalone shell middens returned dates from similar ranges, from 10,900 to 12,100 years ago. One sign absent from any of the newly discovered sites, however, was evidence of construction. The discoveries on Santa Rosa will likely bring more attention to the Channel Islands and Southern California for future research into the early coastal settlement of the Americas, Rick said. But more research at these and other sites is still needed to help clarify the breadth and depth of the first Americans’ occupation on the Pacific Coast, he noted. “Now the important thing to do is excavate some of these sites in detail to see what more we can learn about ancient cultural practices, environmental changes, and other variables,” he said. “We of course, want to do other surveys like this to find other contemporary sites. Rick and his team report their findings in the Journal of Field Archaeology. Could the crescent shaped tools have been used for canoe making? They look too small and thin for canoe making. Remember that the canoes would have been dugouts. The birchbark canoes wouldn’t come until much later, and in the oat if the country where paper birtches grow. Fire and tools like a adz would be more appropriate for a dugout. The crescent shaped blades look like ulu blades to me or side inserts for lance or harpoon points. As for boats, it seems to me that the channel islands did not have many large trees. Lots od drift wood. Perhaps they were making umiaq type boats. They are usually covered with bearded seal skins or split walrus or sea lion skins by Koniaq, Aleut, Yupik or Inuit Eskimoan folks in Alaska. They can be built over 50 ft. log, are sea worthy and easily pulled up steep shores. They need to dried out regularly out an be used to chase whales or haul heavy cargo. The frames are usually made of drift wood. and easily repaired. Crescentics are also found far inland in the Mojave desert and Great Basin. I doubt people were making canoes in these regions, though there certainly were large pluvial lakes in the Mojave at the end of the last Ice Age. The crescent shaped stone tools look similar to the ulu’s (spelling?) used by the Inuit, often associated with maritime economies sort of a blubber matic. Microwear and residue analysis may produce some interesting results. Do they really still cut down redwoods just for that? True, but the indigenous people of southern California used Tule Balsa Canoes- bundles of reed coated with naturally occurring tar found on the beaches. Southern California, specifically the region of coast adjacent to the Channel Islands, did not grow abundant redwoods, It supports oak forests. Redwoods would be the central coast and points north. The tool looks more to be a food preparation instrument, or a type of sweat scraper. Any evidence of them eating sea mammals? I can see them butchering on the beach and then carrying only the flesh up the slope. Why establish themselves up-slope? Defensive position? Cool breezes? Folk memory of severe storms or a tsunami? The turmoil associated with the Oldest, Older and particularly the Younger Dryas periods of 11,500 – 12,000 years ago might have been their “current events”. My guess on the crescent-shaped tools is that they were used to scrape the abalone out of the shells. Are they two-sided, meaning a separate use for the convex and serrated concave side? “Indians”? Come on, who uses that terms for Native Americans anymore? Do you know how much confusion that causes? There are actual theories of people traveling across the ocean to populate the Americas, and this terminology makes it sound like that is what you’re talking about. As a writer for a scientific journal, you should know better. If the term “Indian” is a source of pride and used by the North American Indians today, then the term “Indian” is fine. It’s the political correctness of the generic term “native” that is a fabrication of new thinking. “Indian”, if I remember correctly is a term similar to “Indigenous”. If you thinking that the term “indian” is reserved to people who live in geopolitical India, then you are not respecting their tribal memberships by generically referring to them as the only “indians”. Right? I work with Native Americans who refer to themselves as “indians” or “indian people” and will laugh at you for calling “Native American.” Yeah, “indian” is a misnomer, but Native American and First Nation person are both a mouthful. Others simply identify as members of their ancestral descent. The “Native American” term is generally used by governmental agencies and tribal bureaucrats (and even they and their members identify as “indian” informally), so I find it reflects political issues more than anything else. Since they aren’t from India, they aren’t “Indian” though. Of course people from the subcontinent differentiate much more specifically than “Indian.” A Gujrati is from Gujrat first and the subcontinent second. India, and mistakenly branded Indians! How is calling them what they are , PC?! Saying Native American is too long and a mouthful? Dude, what are you, lazy!!!? Yea for Tom Ridenour! Do you pull? Ever heard the term “Native American”? Black and greens are closer to shore…..
Is it possible, that they were able to collect in deeper water? I think the archaeologists know the difference between Red, Black, and green Abolone, especially since they found evidence for all of them in the middens. Also, the Chumash natives were expert swimmers and divers. problems with article — these are chumash sites. chumash were on the islands and coast longer than these dates. concept of paleo-indians is a continuation of not listening to the chumash despite evidence. arlington springs burial was a young woman, dated 13,500 years ago. chumash. the archaeological report for diablo canyon nuclear power plant cemetery that was dug up before construction. now on the coast but oldest date showed 9500 years continuos occupation. ocean several miles west at that time. coastal sites now submerged. at bottom of the cemetery, obsidian from glass mountain east of mammoth of the sierra. means trade route over 200 miles long in place. nowhere in original report or its 25 anniversary republication and edition can you find a reference to the chumash. instead use of a material artifact to name a pecific archaeological made up period. The Chumash history is largely unknown. Their language was distinct from any of the surrounding tribes at the time of European contact.. The tomol boat employs a construction technology of sewn planks only seen in the region of the Channel Islands, South America, and Polynesia. The shell fish hooks they used resemble those in found in Polynesia. Some of their words are similar to those used in Hawaii, suggesting a recent contact or influx at or after about A.D. 1200. What you refer to as Chumash culture is only a few hundred years old, distinctly different than the cultural remains referred to in the article. The Chumash cultural complex is older than a few hundred years old, and their history is documented by both the Chumash, Spanish, and anthropologist, not even close to not being known. the Chumash have continuously lived in the Santa Barbara area since the beginning of the earliest settlement on the island. All lines evidence for the Chunash, archaeological, linguistic, genetic and craniometrics shows an ancient presence and continuous occupation, on The Northern Channel islands and mainland. Also, the Chumash people and their ancestors were making Tomols, even before the Hawaiians were a separate peopleand wernt even located in eastern Polynesia Hawaii, and have no ties the Americas, The Chumash, the Tomols, or their language. One tenuous word that vaguely sounds like Tomol, is no evidence, without DNA, Plant foods, Artifacts, or Strange diseases, is evidence that they didnt.reach the California Chumash Natives! AND since the Chumash have been sedentary, and have lived in the same.area and on the same islands, Their cultural signatures and lithic assemblages, show a continous record in California, as early, or earlier as 14,000 Ybp. Same.goes for all Seafaring Nafive groups on the West Coast of the Americas. Erlandson, Johnson and Kempe. Have there been any DNA studies from the 13, 000+ yr old female skeleton, compared with surviving Chumash Indians? That could be a great way to determine that this is a direct ancestor to the Chumash. The Chumash were a Very Remarkable Culture with a sophisticated Astronomy/Astrology worldview. oh boy! these articles are difficult to read. Is this some big surprise? San Francisco has sites 10,000 years old that have been ignored to justify claiming Ohlone are all gone. Also, please consider when speaking of ‘Midden,’ many of these Sites were BURIAL sites and WHO buries their ancestors in Trash! No one! (shared by an elder). Please, its 2014. Can you speak with any Chumash for this article? I don’t know if the larger archeological community understands how your articles and way of speaking come off to other people. We have so many positive collaborations, maybe learning how it feels to hear these silly lopsided reports will make a difference. Many native people won’t talk to you guys at all, its simply too painful to hear the ignorance spoken with an air of authority. I am sorry but many societies use old trash dumps for burial sites, Dumps are used in prehistoric because the undisturbed soil, it is very difficult to excavate a grave. It is not a matter of disrespect, it has do with realty. Every society has its own particular way of dealing with the bodies of their dead. Tribal elders often have important insight into the past but frankly I have run into a few that were full of nonsense. Many modern archaeologist avoid speculation about the tribal identification of prehistoric sites with modern tribes. They simply allow the evidence to speak for itself. Unfortunately, this open collected to interpretation by everyone, sometime speculation takes us far afield. These sites, are very early and should expand our knowledge of the settling of the Americas. You hinted at Polynesian influence. Could be but not until 3 or 4 thousand years ago at the earliest. We are limited by trying to view civilizations of 10,000-20,000 years ago through the prism of our current world. Considering that 1) Most civilizations have located themselves near bodies of water like coastlines or rivers and 2) The level of the oceans 10,000-20,000 years ago was 200-300 feet lower would mean that the vast treasure trove of archeological evidence lies 200-300 feet underwater in locations of what would have been the coast line of the time. If science develops inexpensive undersea drones with decent sensors we may have to rewrite much of what we know about civilizations of North America and the world. Is this some type of artifact? you could use the crescents for scooping out the abalone? One of the problems which arises from such “theories” as the “sea-faring” immigrants is the isolation of inconvenient facts which are not considered. 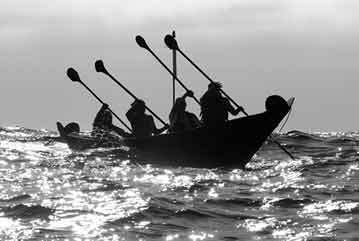 For example, it has been proven that the Pericú tribe of the tip of Baja California Sud The Pericú were one of the few aboriginal groups on the California coasts to possess watercraft other than tule balsas, making use of wooden rafts and double-bladed paddles. Also if you read the accounts written by early Spanish explorers and by-sea expeditions they state they sometimes easily traveled along the coast usually in sight of land. The Chumash used redwood driftwood to construct their highly specialized Tomol Boats that took up to 6 months to build. Yes, it was redwood. NOT’ NORTH TO SOUTH, BUT RATHER SOUTH TO NORTH? READING ABOUT THE CLOVIS CHILD & THE DNA COMPARISONS TO OTHER POPULATIONS… ONE HAS TO WONDER THAT MORE MID-TO SOUTHERN AMERICAN DNA WAS SHARED BY THIS APPROACH THAN BY THE FLOW SOUTHERNLY. I LEAVE THIS TO YOU GENTLEMEN OF GREATER UNDERSTANDING THAN I. HAPPY FLOW-HUNTING! The crescent bear strong resemblances to several more modern tools. a) One is one of the long handled tools used for butchering whales and harvesting whale blubber. Known as a flensing tool. 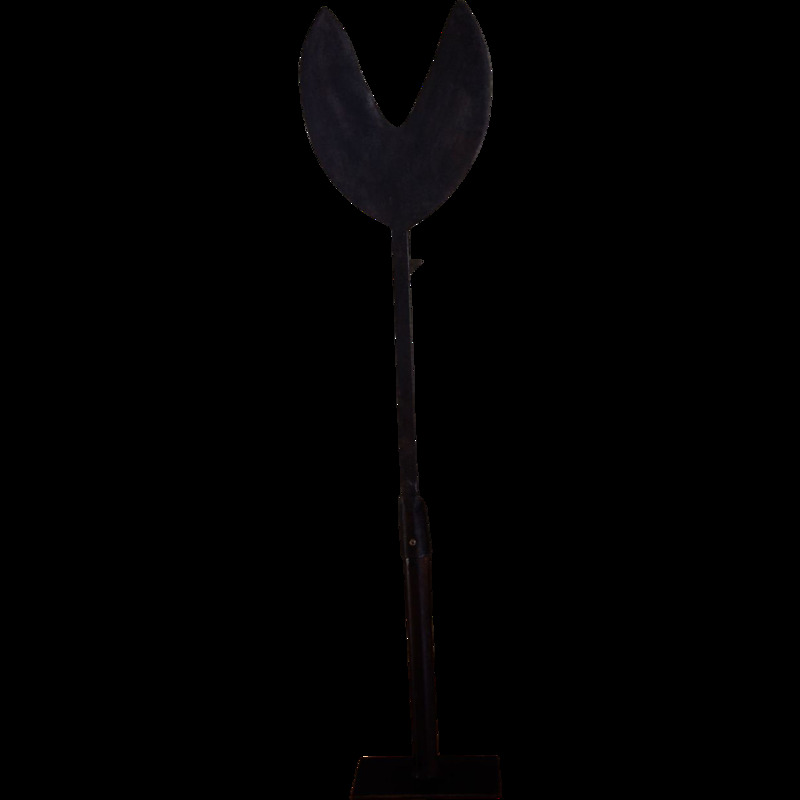 b) Inuit ulu knife. An all purpose tool as the Inuit use them, but particularly good for skinning game and harvesting meat. Your thoughts on a multi-utilitarian purpose are valid. Another purpose is that the looks efficient for scraping bones and harvesting marrow. Concave toothed side, perhaps fish scalers? Convex side looks right for scraping the insides of clam and abalone shells. 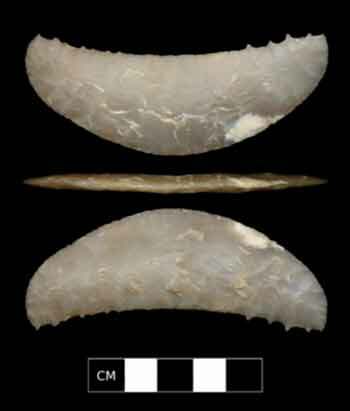 The cresent shapped stone tools found at paleocoastal -indian sites in San Mugal island, off coast of Calif, could also be a remnant knife technology from Indian Migration out if Alaska. Continued research to find Juan Rodriguez Cabrillo burial site might center on Santa Catalina Island.